A luscious recipe collection from Australia’s ‘queen of chocolate’. Recipes that hold your hand every step of the way so you can create chocolate perfection at home. Dark and luxurious or creamy and light … drizzling, oozing or baked … there are many ways to enjoy chocolate, but there is only one ‘Queen of Chocolate’. 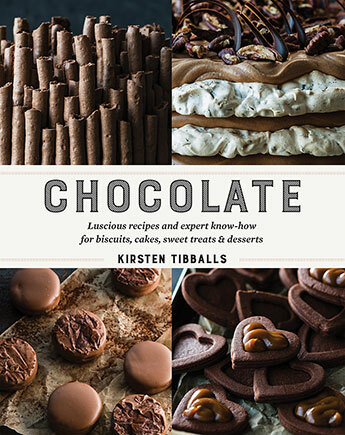 Kirsten Tibballs, world-renowned chocolatier and pastry chef, has devoted her life to the pursuit of delightful desserts, perfecting her techniques and creating decadent treats that make people happy. You’re in the hands of a professional. I can sum up this book pretty easily and simply in just one word – DELICIOUS! Stay tuned – over the next few days I will bring you my selection of mouth-wateringly scrumptious recipes from this exciting book. **Images and recipes from Chocolate by Kirsten Tibballs (Murdoch Books) RRP $49.99 available now in all good bookstores and online. This entry was posted in Book supplied by publisher or author for review, Cook Books, Food and Drink, Recipes and tagged best ever chocolate cook book. Bookmark the permalink. I have that same feeling Margot 🙂 Do you think I might be able to find a sponsor to provide me with best quality cooking chocolate? 🙂 I think I might need one with all the cooking I am going to be doing.